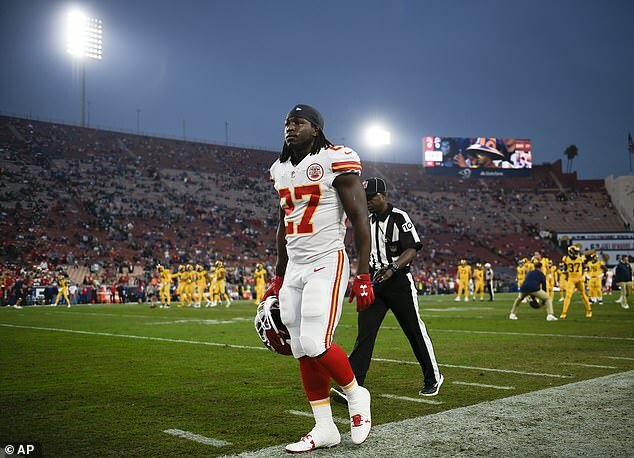 Refuting a recent report, an NFL spokesman said the league submitted a request to Cleveland Police in February for the security footage of now-former Kansas City Chiefs running back Kareem Hunt attacking a 19-year-old woman earlier that month. On Tuesday, Kansas City’s ABC affiliate KMBC published a report claiming that neither the league nor the Chiefs requested the surveillance footage. ‘We had multiple verbal conversations with Cleveland police officers and requested surveillance video immediately upon learning of the incident in February,’ NFL spokesman Brian McCarthy told the Daily Mail in a statement. As NBC reported, the Cleveland Police said the department is looking into the NFL’s claim, but they currently have no record of the request. The footage shows Hunt violently shoving the woman to the ground and later kicking her as she was crouching. Neither the NFL nor the Chiefs are listed among the public records requests listed by the Cleveland Police in the KMBC report. The question of whether the NFL requested the video is significant because Hunt went unpunished until TMZ released the video last week (he was subsequently suspended, placed on the commissioner’s exempt list, and released). According to the Athletic, the Chiefs were aware of the existence of the video in February, but were told by the league to stop pursuing it because the NFL would handle the investigation. This is reportedly standard procedure because the NFL does not want teams investigating themselves when they might have an interest in keeping certain players on the field. Additionally, the league did not interview Hunt or the woman he allegedly assaulted when it investigated the offseason incident, according to an ESPN report. ‘The NFL’s ongoing investigation will include further attempts to speak to the complainants involved in the incident. It will include a review of the new information that was made public on Friday – which was not available to the NFL previously – as well as further conversations with all parties involved in the incident,’ the league’s statement concluded. 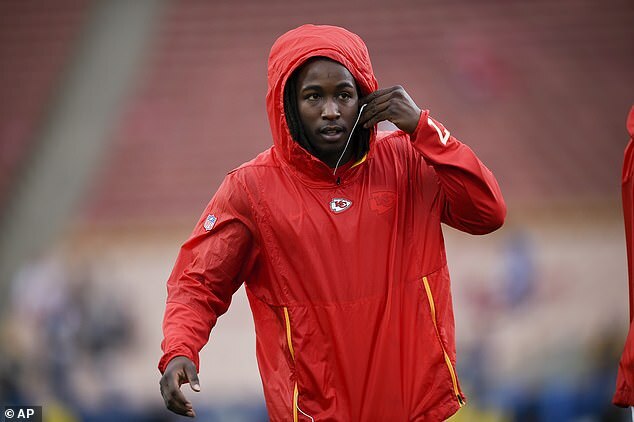 The NFL is mulling a multigame suspension for former Kansas City Chiefs running back Kareem Hunt that could last into the 2019 season, ESPN reported Tuesday. The league is considering three different off-field incidents involving Hunt, the bombshell coming last week when TMZ released a video showing Hunt pushing and kicking a woman in Cleveland in February. Hunt was also involved in an altercation at a restaurant last June, an incident the NFL was aware of and questioned the running back about. However, TMZ reported Monday that Hunt was involved in a violent incident last January at a Kansas City nightclub, an altercation the NFL did not previously know about, according to ESPN. In that incident, TMZ reported that Hunt and others – including then-Chiefs running back George Atkinson – beat a man to the point of unconsciousness in January. 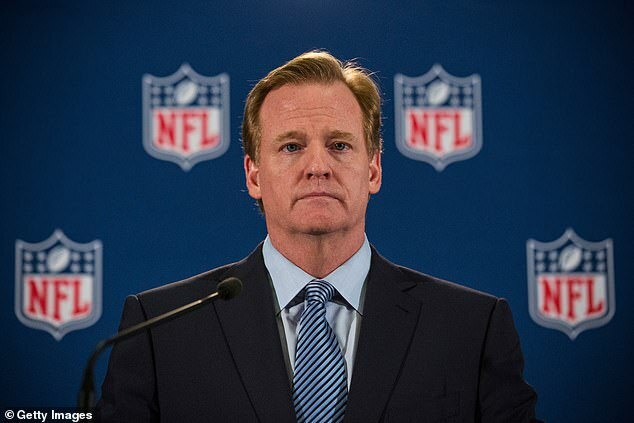 The league’s effort to pursue the security footage is also significant in light of the 2014 Ray Rice incident, after which NFL commissioner Roger Goodell acknowledged that the league needs to improve its handling of domestic violence allegations against players. In 2014, TMZ released security footage of Rice – then a star running back for the Baltimore Ravens – entering an elevator at an Atlantic City casino with his then-fiancee, whom he has since married. Further footage shows the woman’s unconscious body being dragged out of the elevator by Rice moments later. In February of 2014, then-Baltimore Ravens running back Ray Rice and his then-fiancee (now wife) were arrested after an altercation at an Atlantic City casino. TMZ released footage of the two arguing as they entered the hotel elevator, and further footage shows the woman’s unconscious body being dragged out of the elevator by Rice moments later. Rice was initially suspended for two games in July of 2014, and criminal charges were later dropped after the former Rutgers star agreed to counselling. 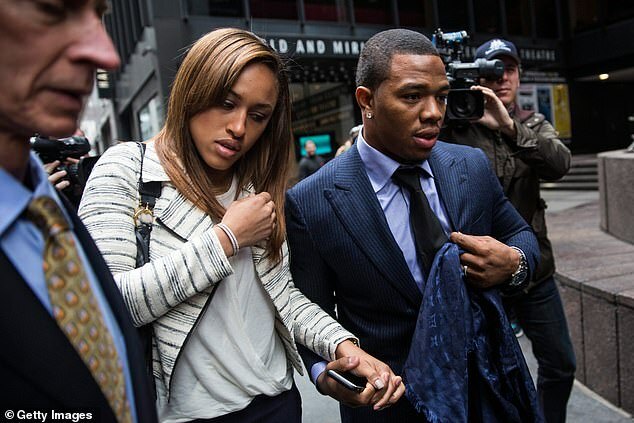 Both Rice and his fiancée Janay Palmer met with Goodell to explain the circumstances surrounding the incident. Later reporting by The Wall Street Journal claimed that Goodell believed she was knocked unconscious after falling in the elevator. Goodell did update the league’s domestic violence policy in response to the incident in August of 2014. In September of that year, footage from inside the elevator was released that showed Rice striking his fiancée, knocking her unconscious. Similarly to the ongoing situation with Hunt, the league claimed it requested the security footage, but was denied. Ultimately Goodell claimed that Rice and his fiancee misled him about the incident. Rice was suspended indefinitely and released by the Ravens. He has not played in the NFL since then, but the couple remains married. Since the video of Hunt was released, other accusations of violence have surfaced against the Ohio native. A Kansas City police report names Hunt, along with former Chiefs running back George Atkinson and one other as the suspects who beat a 38-year-old man inside Mosaic nightclub, breaking his rib and nose on January 7. The NFL is also reportedly investigating a separate incident where Hunt was accused of punching a man in the face at an Ohio resort in June after getting into a verbal altercation. Hunt went to high school in Willoughby, Ohio and played in college at Toledo before being drafted by the Chiefs in the third round of the 2017 draft. He led the NFL with 1,327 rushing yards as a rookie.